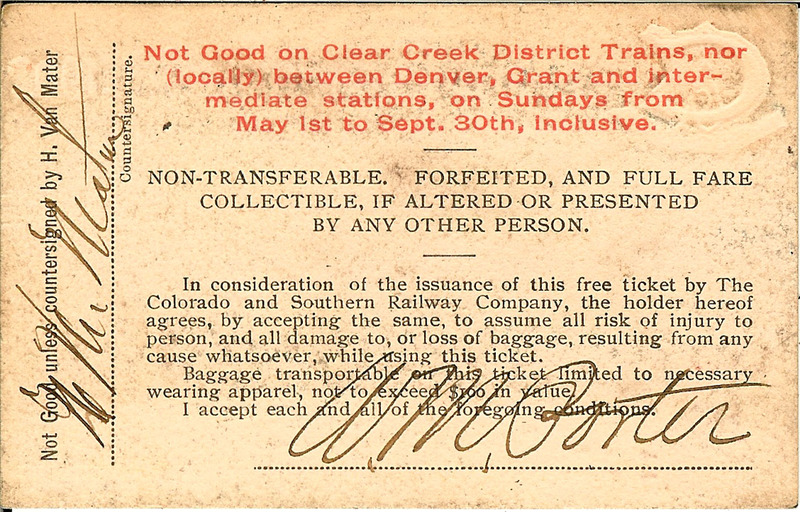 We just purchased an extensive Colorado railroad pass collection. We will endeavor to list, image, and detail each pass beginning with this web page. 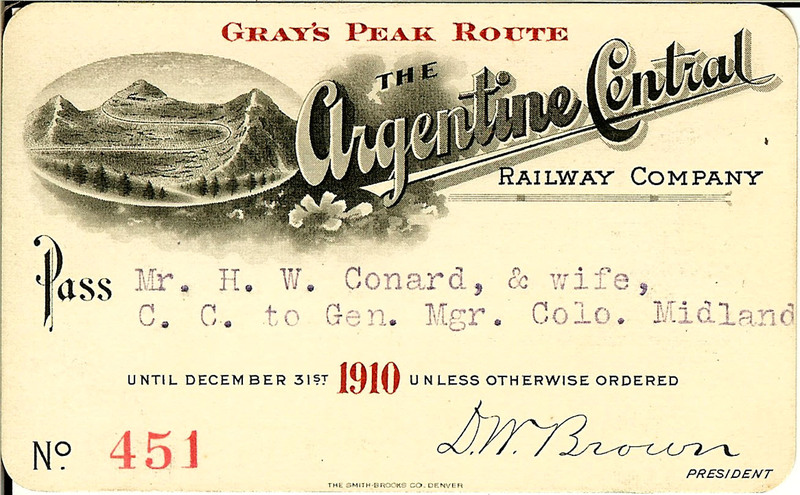 If you are looking for one -- or several, or many -- of those long-sought-after narrow- and standard-gauge Colorado railroad passes to complete your collection, Contact Us with your interests. 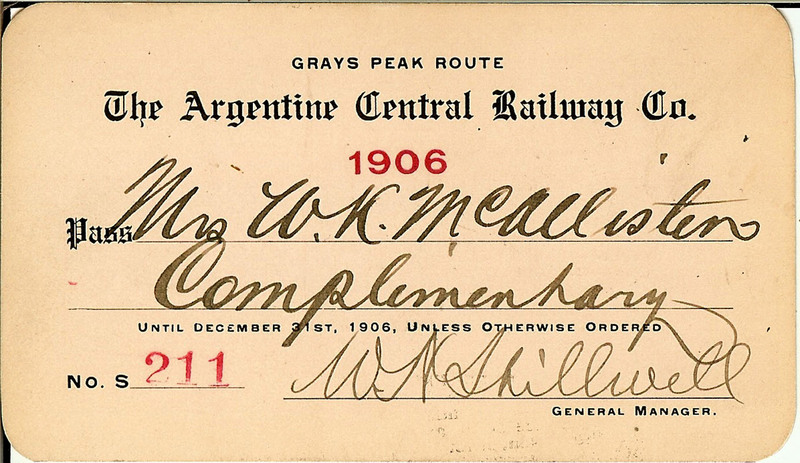 THE ARGENTINE CENTRAL RAILWAY COMPANY, Pass No. 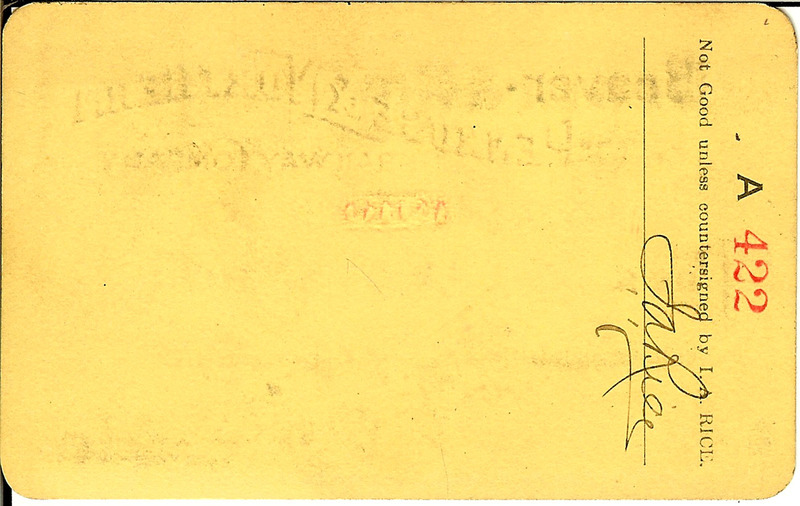 451, issued 1910 to Mr. H. W. Conrad & Wife, C.C. to General Manager of the Colorado Midland. D.W. Brown, President. Condition: near fine. 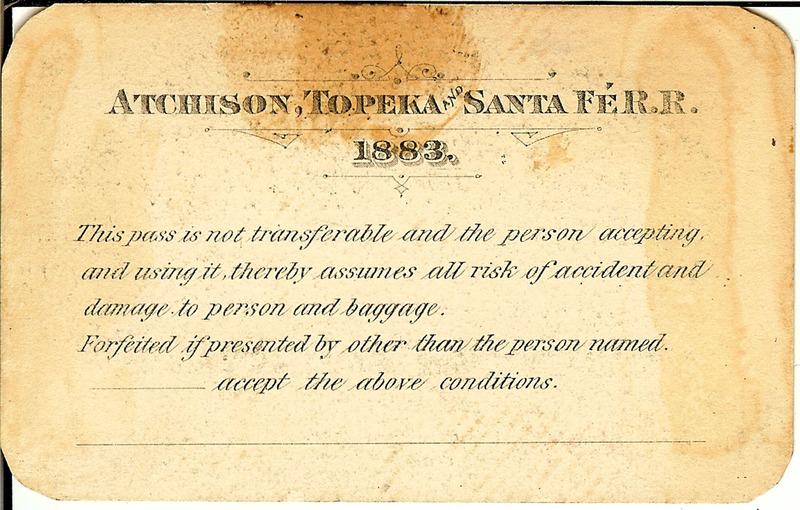 ATCHISON, TOPEKA & SANTA FE RAILROAD and Leased Lines, Pass No. C310, issued 1883 to William Geagan, General Agent for the M.D.T. 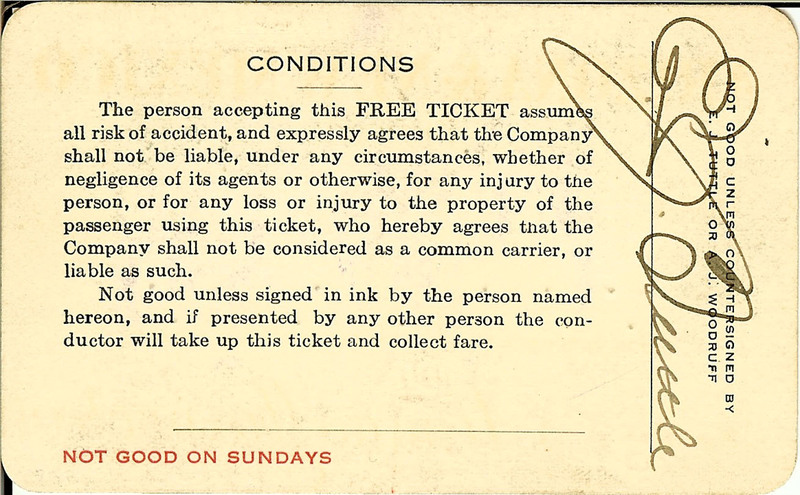 Co., signed by C.C. Wheeler, General Manager. Condition: very good with smudging and foxing stains on front and back of pass. 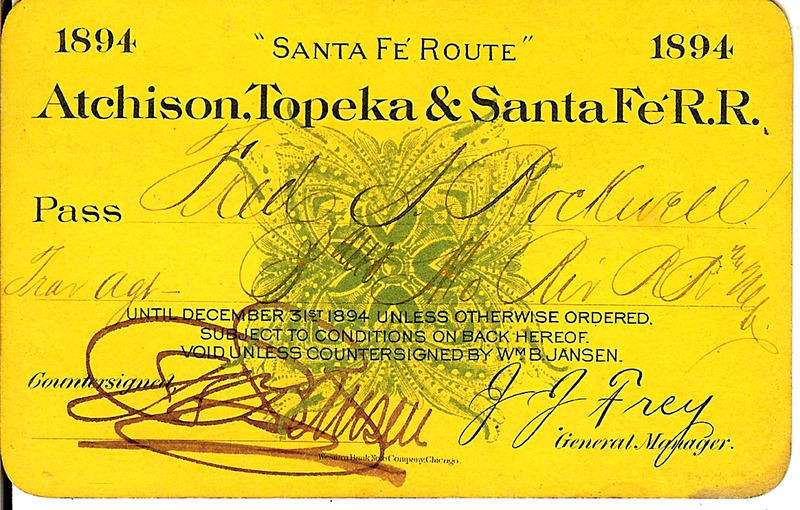 ATCHISON, TOPEKA & SANTA FE RAILROAD, "Santa Fe Route," Pass No. 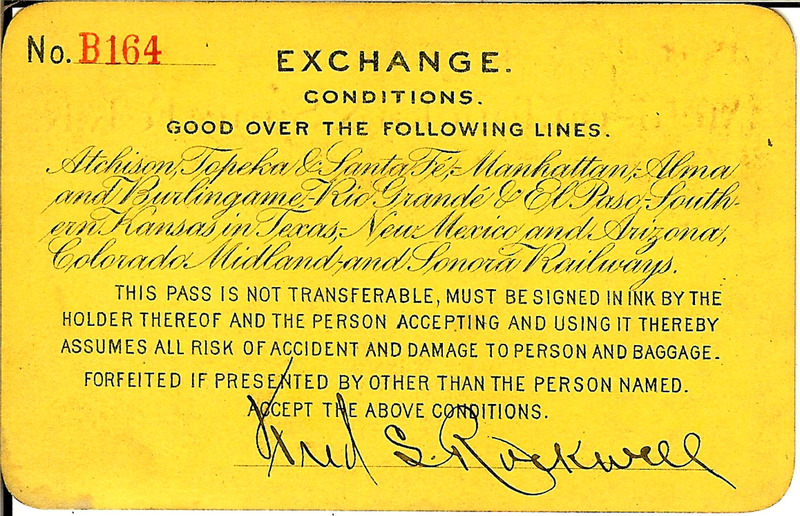 B164, Exchange, issued 1894, to Fred S. Rockwell. 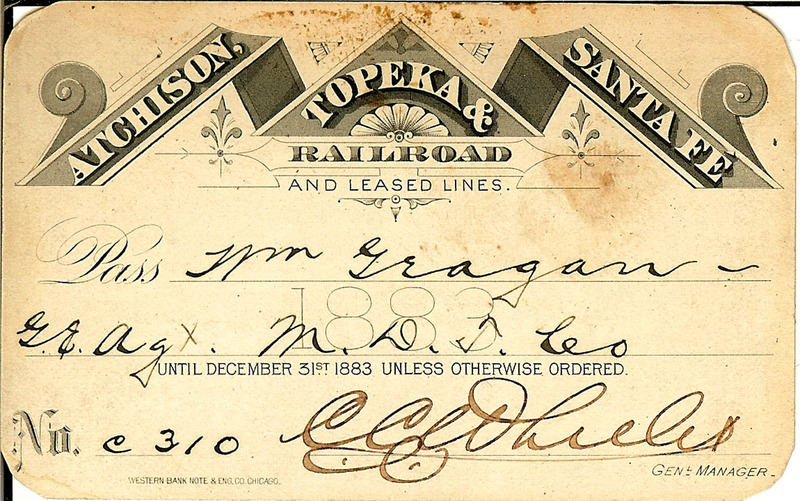 Good over the following lines: Atchison, Topeka & Santa Fe; Manhattan, Alma and Burlingame; Rio Grande & El Paso - Southern Kansas in Texas; New Mexico and Arizona; Colorado Midland; and Sonora Railways. Condition: near fine. 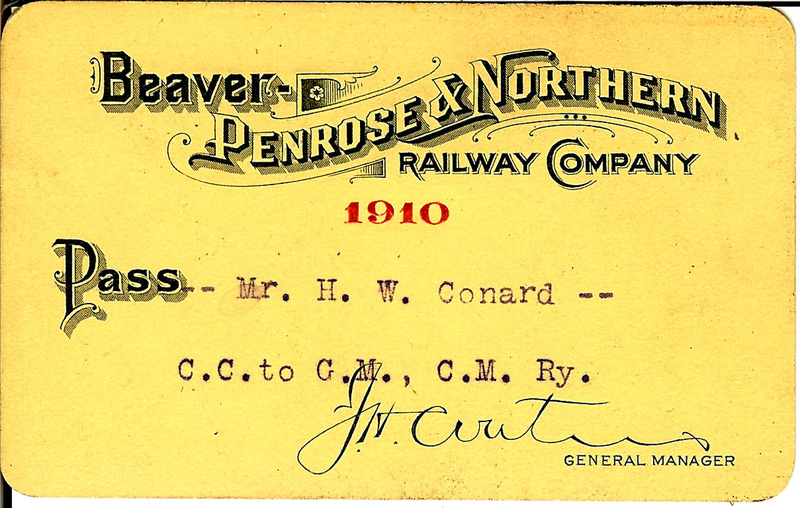 BEAVER, PENROSE & NORTHERN RAILWAY COMPANY, 1910, Pass No. 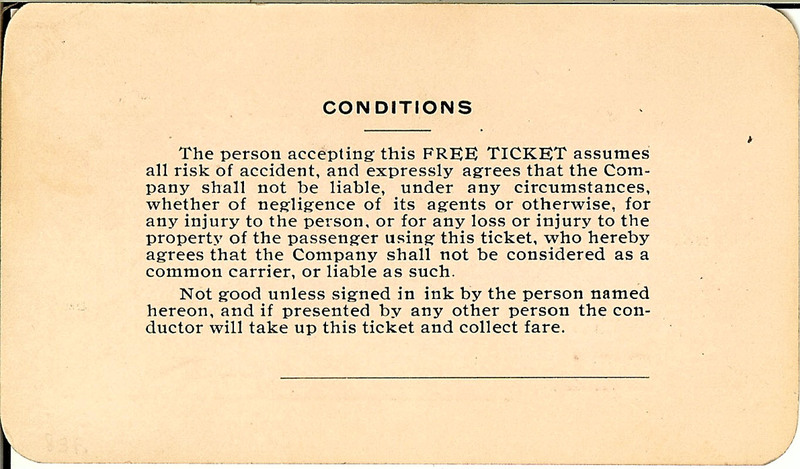 A422, issued to Mr. H.W. Conrad, C.C. to C.M., C.M. Ry., J.H. Waters, General Manager; countersigned on back by I.A. Rice. Incorporated in 1909 as part of the business of the Beaver Park, Land and Irrigation Company, under the direction of Spencer Penrose. Condition: near fine. 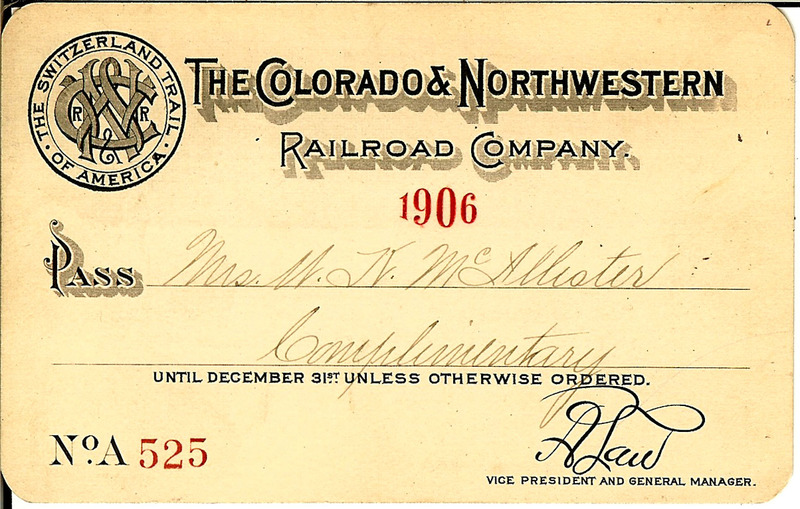 THE COLORADO & NORTHWESTERN RAILROAD COMPANY, Pass No. A525, issued to Mrs. W.K. McAllister, 1906. R. Law, vice president and general manager; signed by W.B. Hayes and Mrs. W.K. McAllister. Near fine condition. 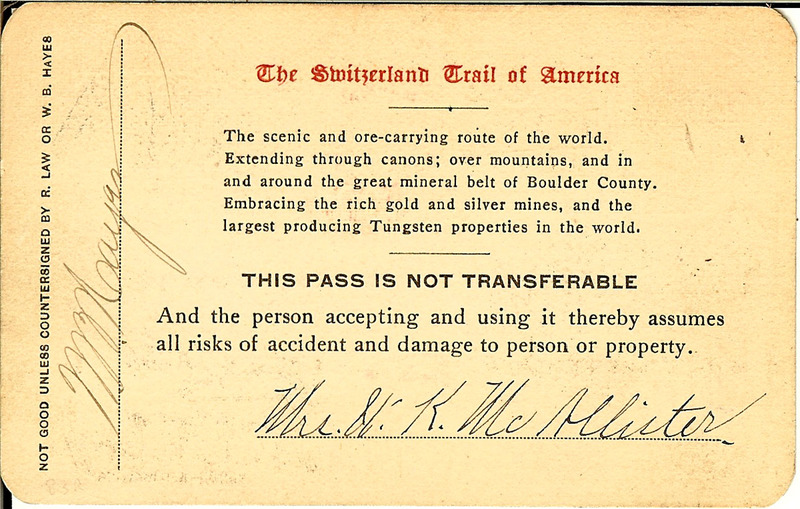 "The Switzerland Trail of America." Traveling through the rich gold and silver mines of Boulder County, Colorado. 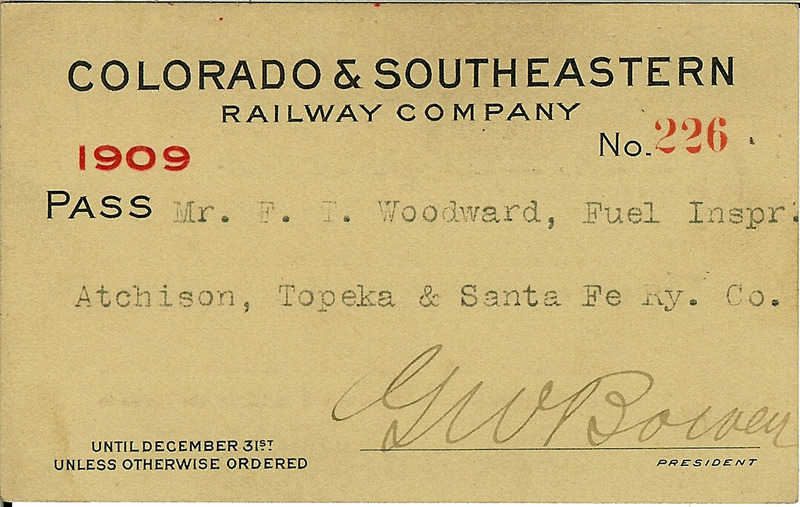 COLORADO & SOUTHEASTERN RAILWAY COMPANY, Pass No. 226, issued 1909, to F.T. Woodward, Fuel Inspector, Atchison, Topeka & Santa Ry. Co. Signed by G.W. Bowen as president. Condition: near fine. Railroad was incorporated in 1909 and traveled between Trinidad and Florence, Colorado. 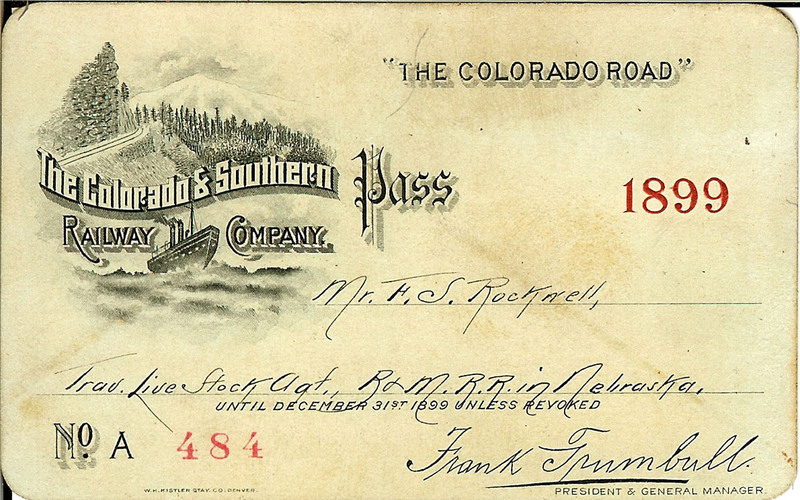 THE COLORADO & SOUTHERN RAILWAY COMPANY, Pass No. A484, issued 1899 to F.S. Rockwell, Travel Livestock Agent, R&M RR in Nebraska. Signed by Rockwell on back. Also, countersigned by S.M. Hudson for the company. Condition: very good plus; some light soiling. 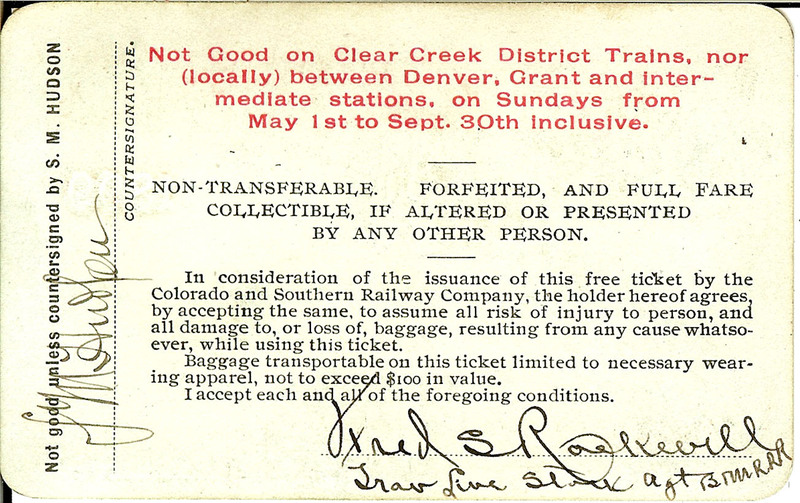 Clear Creek District, Colorado trains; also, Denver, Grant and Intermediate stations. "The Colorado Road." 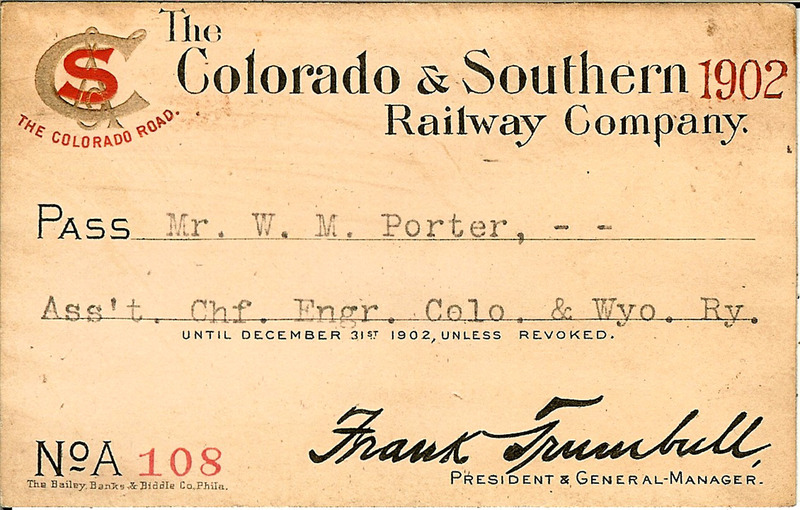 THE COLORADO & SOUTHERN RAILWAY COMPANY, Pass No. 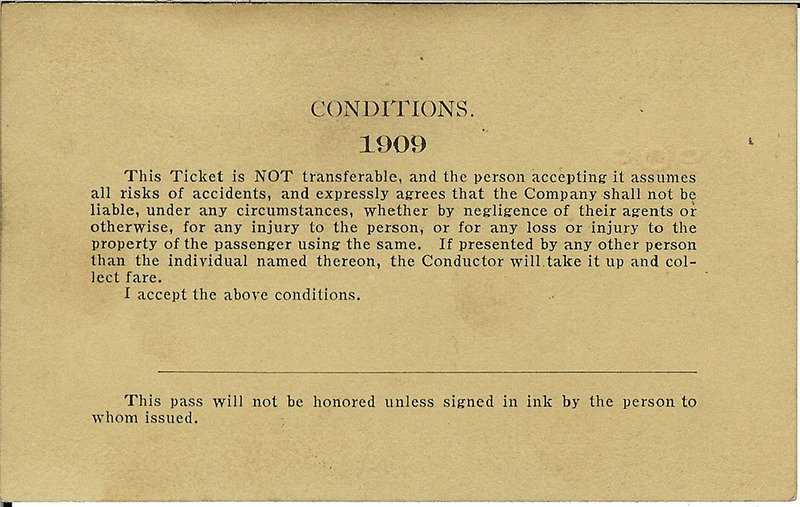 A205, issued 1900 to F.S. Rockwell, Travel Livestock Agent, B.&M.R. R.R. in Nebraska. Clear Creek District, Colorado trains; also, Denver, Grant and Intermediate stations. Very good plus condition. "The Colorado Road." 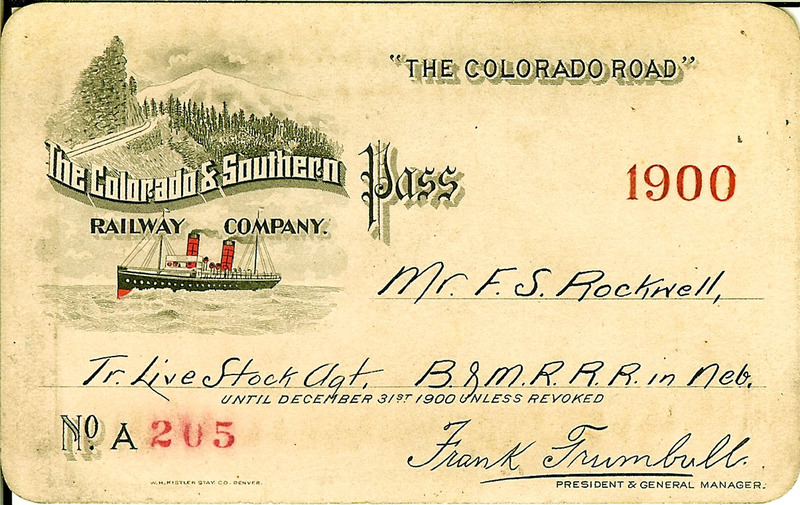 THE COLORADO & SOUTHERN RAILWAY COMPANY, Pass No. A108, issued 1902 to W.M. Porter, Assistant Chief Engineer, Colorado & Wyoming Railway. 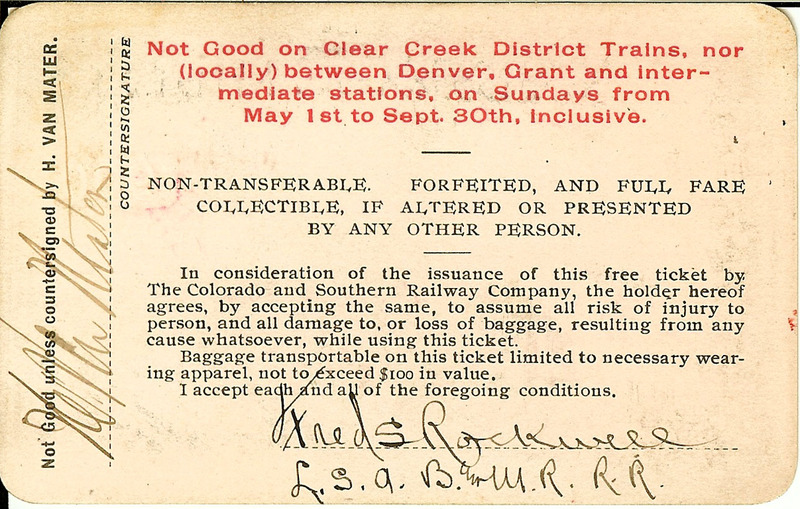 Clear Creek District, Colorado trains; also, Denver, Grant and Intermediate stations. Very good plus condition. "The Colorado Road."